Welcome back. Ahhh sleep. Sleep was one of the earliest topics I blogged about, and I came back to it several times (see list and links in P.S.). But today’s post on sleep is the most, well, soothing. Wouldn’t you like to be rocked to sleep? 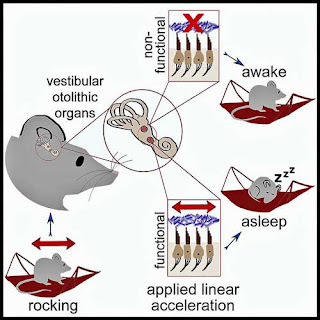 Collaborating researchers from Switzerland’s Geneva and Lausanne universities conducted two studies on the benefits of a whole-night rocking motion for sleep--one study with humans, the other with mice. I’ll preface my review of those studies with a few words about the types of sleep. Sleep is normally characterized as rapid-eye movement (REM) sleep preceded by stages of non-REM sleep. 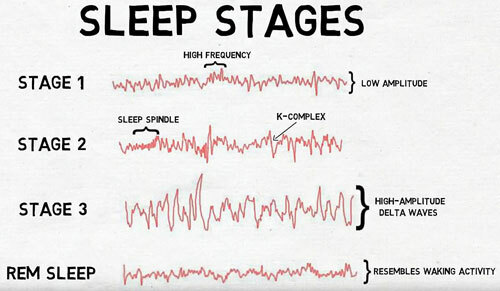 We typically cycle through non-REM and REM sleep multiple times every night. Each is associated with specific brain wave activity. (from 2-minute neuroscience video https://youtu.be/iWo90uxkNM0). The non-REM sleep stages are generally recognized as stage 1, falling asleep; stage 2, light sleep; and stage 3, deep sleep. During REM sleep, eyes move rapidly behind closed eyelids, most dreaming occurs and brain wave activity becomes closer to that of wakefulness. After preparatory activities and screening, the researchers had 18 young adults (mean age 23.4 years, 10 female) sleep three nights in a sleep lab. One night was to become accustomed to the polysomnographic setup used to record brain waves, blood oxygen level, heart rate, breathing and leg and eye movements. One night was to be monitored while sleeping on a gently rocking bed (frequency of 0.25 Hz, moving laterally 10.5 cm). One night was to be monitored while sleeping on a stationary bed with the rocking motor running for noise only. The rocking- and stationary-bed nights were 5 to 14 days apart for each participant in a randomized order, with a full suite of whole-night monitoring (EEG, EOG, EMG, ECG and a thoracic belt with 22 scalp electrodes). As part of the testing, the participants studied pairs of words in the evening. 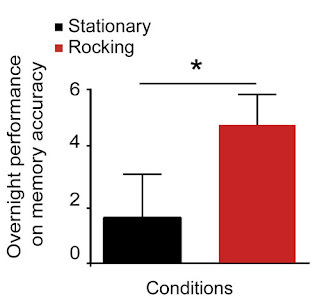 The researchers measured recall accuracy in the evening and again the next morning. Sleeping on a rocking bed, participants fell asleep faster, slept longer in non-REM sleep, slept more deeply and woke up less than they did sleeping on a stationary bed. And they scored higher on paired word recall, reflecting increased memory consolidation--the conversion of short-term to long-term memories. Analysis of the EEG brain responses showed continuous rocking stimulation strengthened deep sleep via neural entrainment of intrinsic sleep oscillations (slow waves and spindles). Mice with EEG and EMG electrodes were rocked laterally in their cages during their main sleep period using commercial reciprocating shakers. Rocking the mice at a frequency of 1.0 Hz (4 times faster than humans) increased the duration of non-REM sleep by shortening the time it took to fall asleep as well as wake episodes; however, the mice did not appear to sleep more deeply than when stationary. Going further, the researchers tested their hypothesis that the rocking effects are linked to the vestibular system of the inner ear, which provides balance and an awareness of spatial orientation. They conducted the experiment with mice that lacked functioning otolithic organs and were thus unable to encode linear acceleration. Graphical abstract of mice sleep study: Rocking promotes sleep; linear acceleration applied to head encodes rocking stimulus; rocking effects on sleep are acceleration and time specific; otolithic organs mediate rocking effects on sleep (from www.cell.com/current-biology/fulltext/S0960-9822(18)31608-7). The findings of these studies could lead to new treatments for insomnia and other sleep disorders in addition to opening the door to promising clinical research. If you’re anxious and wondering how you can take immediate advantage of the findings, there’s at least one manufacturer selling rocking beds. Sleep well, and thanks for stopping by.